Payam Saljoughian is a senior attorney at Hanson Bridgett LLP, a regional firm based in San Francisco. Payam’s practice focuses on representation of the firm’s health care clients, including hospitals, assisted living facilities, skilled nursing facilities, and continuing care retirement communities. 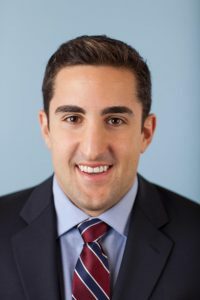 Payam‘s work involves regulatory matters, licensing, contract drafting, and Medicare and Medi-Cal reimbursement, as well as some litigation involving unlawful detainers and other resident disputes. Payam also helps businesses navigate laws impacting health care providers, including HIPAA, the Stark law, and the Anti-Kickback Statute. In addition to his health law focus, Payam helps nonprofit charities with everything from formation to dissolution, and importantly in obtaining federal and state tax exemption. Payam also periodically represents asylum applicants on a pro bono basis. Payam is a 2011 graduate of UC Hastings College of the Law. He obtained his bachelor’s degree in Health Sciences from UC Santa Cruz, where he was a member of the swim team. In his free time, Payam competes in and coaches CrossFit. He is a huge Warriors fan and a HUGE Team Melli fan!